1 Bedroom Beachfront Villa in the middle of Bangrak Beach. Walk along the beach in any direction to many beachfront bars, restaurants and shops. No need for a car. The beautiful little bungalow sits directly on the gorgeous sands of Bangrak Beach offering a haven of retreat to couples or small families. A few steps from your terrace and you are ankle-deep in the pristine and beautiful white sands. However, the charm of that terrace may make you hesitant to ever leave. The wraparound terrace features a charming and utterly comfortable hammock, sun beds, a lounge area, a roof-top sala, outdoor dining options – some with full shade and some in full sun, and inside an open floor plan that makes the most of the gorgeous light coming in from the beach beyond. This is a property which has a truly charming interior. As you enter from the covered terrace, the open plan bedroom, dining, lounge and kitchen are complimented by the floor to ceiling patio doors opening up fully – allowing those ocean breezes and magnificent views wherever you are within the property. The villa is only a 2 minute walk to a first-class hotel, which opens its doors to guests for sumptuous dining options, well deserved spa treatments or a day lounging beside their swimming pool. Very close by, within walking distance, there are many more dining and shopping options, and even restaurants that will deliver directly to your door! Many of the attractions Koh Samui offers its visitors are located within 10-15 minute drive. 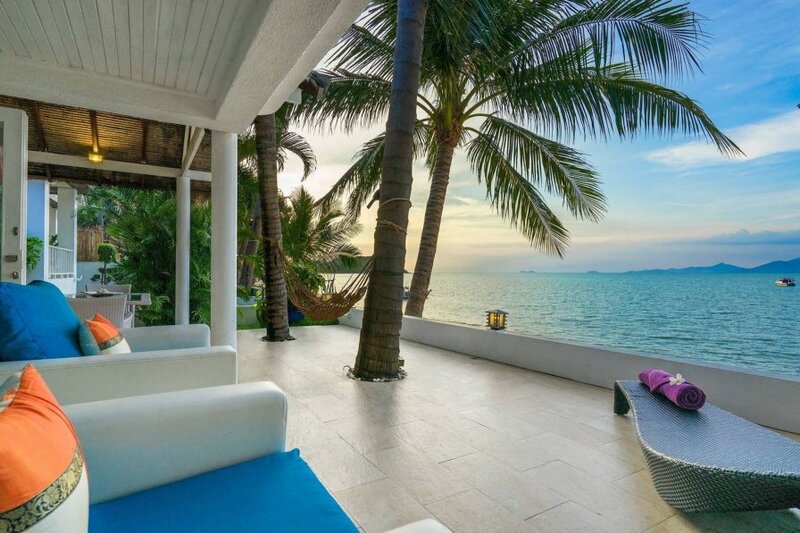 Whether you want to explore the area or just get the very most out of your beachside retreat, this little villa will provide the ideal setting. For larger groups traveling together, there is an equally stunning 2 bedroom bungalow located next door to this one. Please contact us for options of renting out both properties together. The electricity meter is read on check-in and check-out and charged at B7.5 per unit as per the government. Please note: In Thailand, no shoes are allowed inside houses or villas. They are always taken off before entering the house.